If you like movies about determination and the will to live you probably had a blast watching 127 Hours. If you haven't heard it's about a guy that got stuck to a rock while spelunking somewhere in America (sorry I can't remember details). 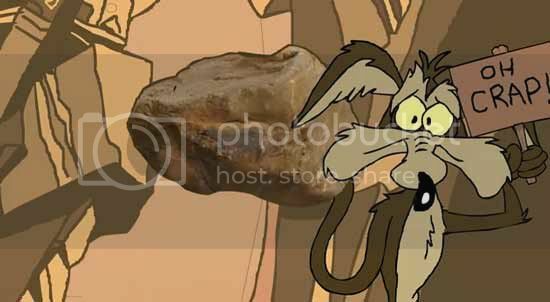 Now I'm pretty sure a Wile E. Coyote type of scene crawled at the side of my brain while watching the movie but it quickly got away because of all the suffering and arm amputation that was happening in the movie. Anyways, the short animation after the break will entertain you for about 2 minutes of your life. I wish I had something like his multi-tool though. If you like the Road Runner cartoons way back when we didn't have the internet then you're in for a treat. Check it out after the break.